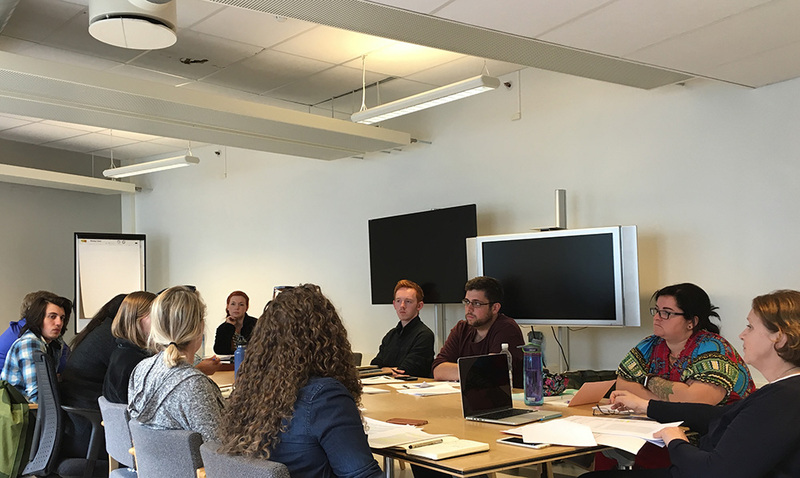 Since the design brief assignment will lean quite a bit on the appropriate literature regarding families and museums, Dr. Palmyre Pierroux, a professor and researcher with whom we are collaborating at UiO, started the program off by leading a reading group. Each student team lead the discussion on one of the five papers. This activity allowed the design students, who were newer to the museum literature than their UiO team members from the Communication, Design and Learning Masters program, to get up to speed on some of the issues surrounding family interactions in museum visits. Falk, J. Understanding Museum Visitors’ Motivations and Learning. This article was commissioned for engage journal, and was first published in engage 25: Family Learning, Spring 2010, ed. K. Raney, London, UK, pp. 19-30. Knutson, K., & Crowley, K. (2010). Connecting with art: How families talk about art in a museum setting. In M. K. Stein & L. Kucan (Eds. ), Instructional Explanations in the Disciplines (pp. 189-206). New York Springer. Gangsei, E. (2012) SFMOMA’s Art Game Laboratory: Real-Life Mad Science Experiments in Visitor Engagement. Giannachi, G., Carletti, L., Sinker, R., Ward, R., Stack, J., Locatelli, C., . . . Benford, S. ArtMaps: Framing Public Engagement. NODEM Proceedings 2015.